John McElroy, c. 1872, the year he turned 90. Photograph: University Archives, John J. Burns Library, Boston College. The man was old. that was so obvious that it was easy to overlook. When he first got the idea for what became the major accomplishment of his life—the creation of Boston College—he was already 65; his most intensive work on the project didn’t begin until he was 73, and he was 81 before the whole business was successfully concluded. If he had never undertaken to establish a school for the sons of Boston’s Irish Catholic immigrants, he would still have lived a full life. It was a teacher’s life and a pastor’s life. He was born near the town of Enniskillen in County Fermanagh, Ireland, on May 14, 1782, just as the American Revolution was concluding. By the time he died in 1877, more than a decade after the Civil War, he had been for many years the oldest priest in the United States and the oldest Jesuit in the world. Fermanagh was in the Ulster province of Ireland, a border place where Catholics and Protestants claimed nearly equal numbers and sectarian tensions were sometimes high. McElroy’s father was a farmer who managed to wring enough from the soil to send two sons across the Atlantic in search of a better life. Just after his 21st birthday, John followed his brother to America, settling in Washington, D.C., finding work in stores and on the docks there, and coming to know the Jesuits at their small college at Georgetown. Apparently impressed by these men, he felt the call to religious life himself, and was received by the order in the fall of 1806, at age 24. Centuries of tradition in Europe prescribed an extended and reflective preparation for Jesuits, but in America the process was usually more rough and ready. Years later, on the 50th anniversary of his joining the order, McElroy recalled sardonically that “I was promised time to study, . . . but as yet it has not arrived.” Instead, the young novice was given a range of duties, including “assistant cook, gardener, prefect, [and] teacher of writing, arithc., etc.” to students at Georgetown. Expected as part of his formation to meditate daily on the Spiritual Exercises of St. Ignatius and other devotional texts, he found that he often had to do this “the best I could in going to market.” McElroy originally intended to serve only as a lay brother of the Society, but his superiors identified him as a candidate for the priesthood. After an unusually short preparation—less than two years to study Latin—he was ordained in 1817. St. John’s Literary Institute was a modest success during McElroy’s tenure, and he would probably have been content to pass the remainder of his career in the little world that was Frederick. In the mid-1840s, however, he was given an unusual new assignment. War had broken out between the United States and Mexico over the disputed territory of Texas, and troops were headed south to conduct what a cynical observer called “a short, offhand killing affair.” Advocates of annexing Texas pointed to alleged atrocities against American settlers there, while opponents thought the conflict a shameless landgrab designed to increase the power of slaveholding states in the Congress. For the U.S. government, the controversial war was also tricky on religious grounds. To many, who cited recent examples of anti-Catholic nativism, it had the feel of an unprovoked “Protestant crusade” against an overwhelmingly Catholic country. At the same time, nearly a quarter of U.S. fighting forces were Irish immigrants, and the prospect of U.S. Catholics fighting Mexican Catholics was troubling. President James Polk, eager to cover his political flanks, hit on the idea of assigning Catholic priests to accompany the troops. The consolations of religion aside, their presence might reassure the Mexican government and its citizenry that this was not a war against their faith. After consulting several Catholic bishops, Polk informally designated McElroy and Anthony Rey, SJ, as chaplains—he didn’t really have the legal authority to appoint them—to the U.S. Army in Mexico. McElroy apparently had private doubts about the conflict, writing a friend at the time that he hoped international mediation would forestall “the horrors inseparable from war.” When the appointment came, however, he obeyed his Jesuit superiors and, at age 64, left for Mexico, arriving with Rey at Matamoros on July 5, 1846. Rey, 40, was a French priest who had come to America a few years before and taught philosophy at Georgetown. The two were readily accepted by the army’s commanders, and were almost immediately invited to dine with General Zachary Taylor, whose emerging status as the hero of the war would propel him into the White House two years later, in spite of (or perhaps because of) his proud declaration that he had no political opinions whatsoever. McElroy was decidedly underwhelmed by the future president, finding him “plain, slow of speech, and more like a farmer than a Genl.,” a common assessment of Taylor. Even so, “he received us with a great deal of cordiality,” the priest said, “welcomed us to the army, and hoped our mission would be very beneficial.” For the better part of the next year, Rey marched with the troops across the countryside, eventually losing his life in a skirmish, while McElroy remained behind at the base camp and hospital in Matamoros, tending the sick and saying Mass. With the war’s end, Mcelroy returned home to await new duties. At first, there was some thought of making him a bishop. In earlier years, he had periodically directed weeklong spiritual retreats for priests from various dioceses, which earned him a nationwide reputation. Benedict Flaget, the aging bishop of Louisville, Kentucky, expressed a preference for McElroy as his successor, saying of him, “I know of no clergyman who would under existing circumstances suit us as well. [Kentucky’s priests] hold him in sincere veneration since he once preached to them.” Instead, in October 1847 McElroy was sent to Boston to serve as pastor of St. Mary’s parish in the North End, responsibility for which had just been given to the Jesuits by the city’s Catholic bishop, John Fitzpatrick. Then, in 1853, McElroy saw his opening. Boston was in the midst of a decades-long development boom as land in the South End, Back Bay, and elsewhere was steadily reclaimed from the sea. New properties were coming on and off the market, and new buildings were going up everywhere. He found a tract for sale close to downtown on Causeway and Leverett Streets, a spot later occupied by the Boston Garden. The area was known as the “jail lands,” because the city jail had once stood there. McElroy made a down payment of $13,000, arranging a mortgage for the remaining $46,000, but the property came with complicated zoning restrictions. Whoever bought the land was supposed to put up several private homes and stores; and those projects would have to be reviewed by the city council before the sale could be finalized. Two years of contentious negotiations ensued, fueled in part (McElroy and Fitzpatrick rightly thought) by anti-Catholic bigotry from nativist Know-Nothings, who were enjoying a brief political ascendancy in Massachusetts. In the end, the council “obstinately refused,” in Bishop Fitzpatrick’s words, to reconsider the zoning rules, not the last time town and gown would clash over use of the school’s property. McElroy was 75 when his deposit was refunded. McElroy had no doubt that his classrooms would soon be full. He noted that the Sisters of Notre Dame had recently opened a school for girls that attracted nearly a hundred pupils, in spite of its high tuition ($10 per quarter). “I am sure parents will be more disposed to send boys to college than they are to send their girls to a pay school,” he wrote with a condescension common at the time, partly “in hopes of their having a vocation for the holy ministry.” In this, he was over-optimistic, at least at first. When classes finally began in the fall of 1864, just 22 boys showed up—”only one or two had talent,” a fellow Jesuit complained—although by the end of the year the number had doubled and would increase steadily thereafter. Mcelroy was a man of his times, with what today would pass for crotchety, even bigoted, opinions: He attributed the turmoil between factions in a Catholic Philadelphia parish during the 1820s, for example, to the influence of “many Quakers and some Jews.” He also indulged in occasional self-reinvention, recounting stories about himself that got better with each retelling. Just off the boat in 1803, he claimed, he had met President Thomas Jefferson “several times,” a highly unlikely possibility. History not only denied McElroy his rightful place as Boston College’s first president, but seems also to have taken him for granted in other ways. No building on the campus would be dedicated to McElroy until 1961; there would be no McElroy prize or student society; his name has been associated only with the lowest category of alumni annual giving. This might not have displeased him. He was a man of energy but not personal ambition. He gladly relinquished all his worldly possessions when he entered the Jesuits, an unimpressive list: “sundry articles of wearing apparel not necessary to describe in particular; . . . watch + chain, razor, razor strop, and shaving box; . . . a few pictures of different saints.” His real gift, to posterity, was more enduring. In April 2007, the New England Province of the Society of Jesus announced that it was closing the Church of the Immaculate Conception on Harrison Avenue in Boston. Declining numbers of priests to staff the church, together with the costs of upkeep for the 150-year-old structure, had forced this decision. Though it was far removed in recent years from the physical and mental spaces of Boston College, “The Immaculate,” as locals sometimes called it, was once Boston College’s church. Immaculate Conception was erected at the same time as the original classroom building, and John McElroy, SJ, oversaw the construction of both. The two cornerstones were laid in April 1858: The academic building was finished a year later, the church in 1861. Unlike most new urban Catholic churches in America, which favored the Gothic style, this one was planned along the lines of a Roman temple by the architect Patrick Keely of Brooklyn, a prolific builder of churches across the country. Perhaps the classical learning that was the core of the curriculum suggested this design. The church was “lofty in sweep, graceful and chaste in lines,” a contemporary writer observed; “the effect produced on the beholder can be nothing but that of religious awe and admiration.” A “freight car of laurel branches” was reportedly needed to adorn its interior for the dedication. Immaculate Conception was not an archdiocesan parish—the Cathedral of the Holy Cross, just a few blocks away on Washington Street, served that function for the South End neighborhood—but rather a “collegiate church,” scene of all religious and devotional activities at Boston College for the first generations of students. The name of this church had been chosen deliberately. The belief that Mary, the mother of Jesus, had been conceived without original sin was an ancient one, and there had been a commemorative feast day in the Church calendar from the earliest times. Only in 1854, however, had Pope Pius IX declared this belief to be an official dogma of the Church, part of an upsurge of devotion to Mary that was seen throughout the Catholic world in the 19th century. Jesuits had long promoted this Marian devotion, and it was thus not surprising that, just a few years later, they would associate their new church in Boston with it. 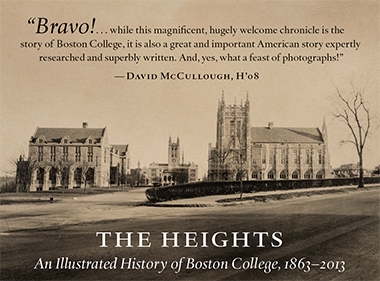 When the University moved to the Chestnut Hill campus in 1913, Immaculate Conception continued to serve Boston College High School, which remained on the original site until 1957. Thereafter, the church offered religious refuge for the people of the many hospitals in the area. Into the 1960s, it was still attracting huge crowds to its “Novena of Grace,” held every March in honor of the Jesuit St. Francis Xavier. More recently, the church has served a predominantly gay congregation, residents of the city’s South End. The last daily Mass was said on Friday, April 20. Sunday Masses were scheduled to continue through July 29. The church building, which city officials once tried to declare a historic landmark in order to thwart efforts to modernize the interior along Vatican II guidelines (the Jesuits won their case before the state Supreme Judicial Court), will likely be sold. James O’Toole holds the Clough Millennium Chair in History at Boston College and teaches courses in American religion. He is the editor of Habits of Devotion: Catholic Religious Practice in 20th Century America (2004) and the author of the 2002 book Passing for White: Race, Religion, and the Healy Family, 1820–1920.